Radiology Based Facebook Game Goes Viral! There were many innovations in Radiology this year, but who would have thought that a Facebook game could be one of the most popular. Ziltron have recently released a Facebook web-game quite candidly called “X-Ray Ninja” which is a quick-fire game initially tackling the area of Emergency Radiology. 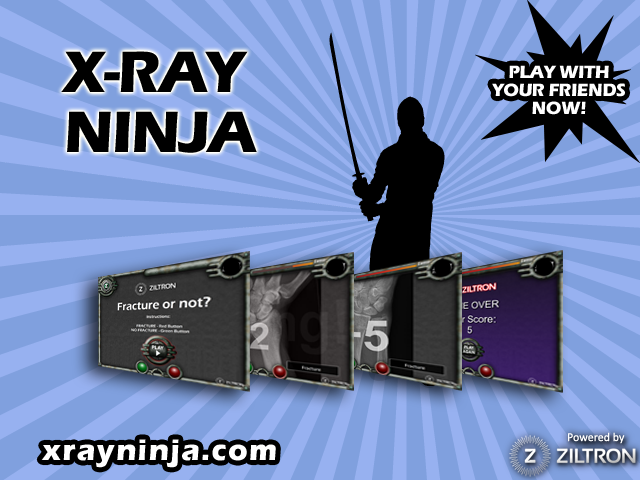 X-Ray Ninja has already been played by 50,000 users and is quickly expanding it's user base. CEO and Founder John Ryan PhD says “We have released many serious apps and web-tools in the field of Radiological performance and education, but with this venture we wanted to go a little more light-hearted!”. It’s not just fun though, Ziltron’s offerings have deep foundations. Dr Ryan is an expert in human observer performance (latest AJR paper here). And together with an advisory board of Harvard Professors and Radiology leaders, Ziltron is raising serious professional interest in the field of radiology. Not only is the audience for “X-Ray Ninja” expanding rapidly, the number of levels and complexity of the game is becoming mammoth, with an array of planned add-ons.